Pick Your Perfect Nursery, We offer: A variety of sheet sizes, changing pad covers, boppy pillow covers, boppy loungers, minky baby blankets, crib bumpers, crib skirts, rail guard covers, curtain panels, and decorative pillows. This collection offers a beautiful variety of florals and coordinates. See sizing and descriptions below. Customize your own bedding set by selecting the item(s) you are wanting in the drop down menu. If you want multiple items you will need to add each item to your cart with your fabric # selection. Then you may check out and add any additional notes to me in the "Notes to Seller" box on the checkout page. If you have different dimensions than what is listed below, you may list your dimensions in the "notes to seller" box and select the item that is closest in size in the drop down menu. Please feel free to message me about any questions at all! Includes a standard box-pleat crib skirt, a fitted crib sheet and a changing pad cover. You may add to this set by individually selecting extra items such as baby blanket, boppy cover, etc. to your cart. If you would like to upgrade to a different style crib skirt, such as the "gathered" style please message me and I will send you a listing for the upgraded price. Please list the fabric #'s you would like for each item in the “Notes to Seller” box, i.e., (crib skirt in #3, crib sheet in #5, changing cover in #10). Includes a standard box-pleat crib skirt, standard crib bumpers with piping (you can choose two different fabrics for inner and outer bumpers), fitted crib sheet, changing cover and baby minky blanket (28x34). You may add to this set by individually selecting extra items such as baby blanket, boppy cover, etc. If you would like to upgrade to a different style crib skirt, such as the "gathered" style please message me and I will send you a listing for the upgraded price. Please list the fabric #'s you would like for each item in your set, i.e., (crib skirt in #3, crib sheet in #5, changing cover in #10). Includes a standard box-pleat skirt, a fitted sheet and crib bumpers. You may add to this set by individually selecting extra items such as baby blanket, boppy cover, etc. to your cart. If you would like to upgrade to a different style crib skirt, such as the "gathered" style please message me and I will send you a listing for the upgraded price. 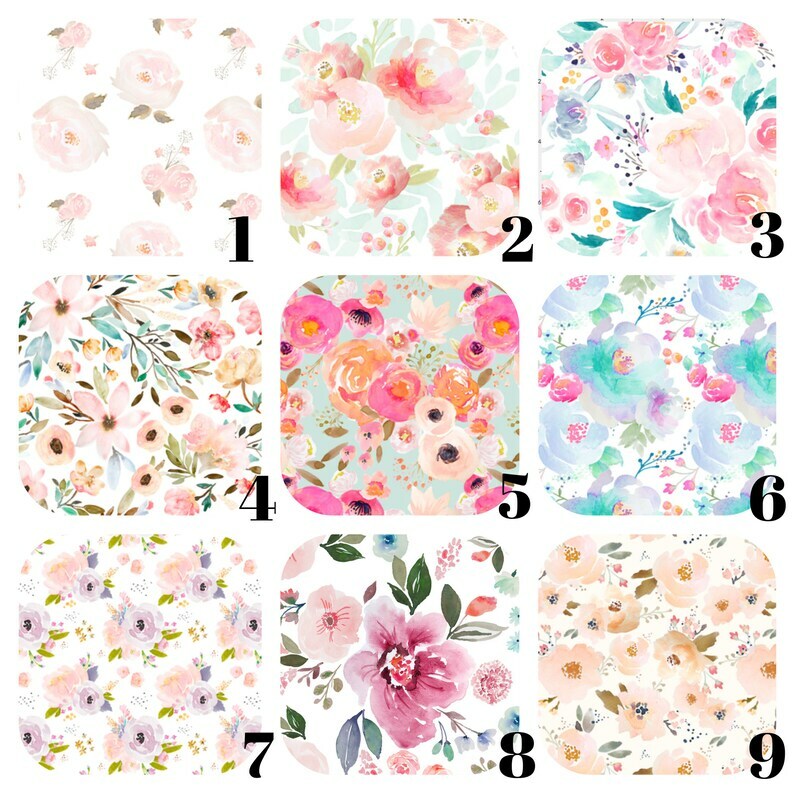 Please list the fabric #'s you would like for each item in the “Notes to Seller” box, i.e., (crib skirt in #3, crib sheet in #5, crib bumpers #10 and #2 w/piping in #2). All the sheets are fitted (unless flat is stated) and have corners sewn with a French seams so there are no raw edges anywhere on the crib sheet. This prevents fraying and has a clean and sophisticated look. Elastic is sewn into hem with a serged stitch all the way around allowing the elastic to stretch with the fabric preventing the elastic from breaking over time. These fitted sheets will be a snug, perfect fit for your mattress! Please check your mattress dimensions below to ensure that your mattress will fit our sheets. If your mattress has different dimensions please message me for a custom listing, I will get back to you quickly! Our standard crib skirt is the 3-sided box-pleat crib skirt. You may also choose a gathered crib skirt or a 4-sided crib skirt. We also make a crib skirt for the Stokke Mini and Stokke Sleepi Crib. All of these options are available in the drop down menu. Our standard skirt is 3-sided, if you need a 4-sided skirt you may select it in the drop down menu or message me for a custom listing. Our crib skirts have a 14" drop (please message me for a custom size drop, there may be an up-charge if we have to order additional fabric). A white panel fits under the mattress to hold the skirt securely in place. There are slits in the corners to cover the brackets of your crib. These are professionally serged, with a double hem on the bottom to create a nice weight which allows the skirt to hang beautifully! If you need different dimensions please message me and I will create a custom listing. Here is a picture of our crib skirt and rail covers. We use a 6-piece style set for the standard crib, and a 4-piece style for the Mini Crib and Stokke Sleepi). We use Nu-foam which is a breathable foam batting. You can choose one overall pattern or you can choose two patterns to have one on the inside and one on the outside of the bumper. You can also choose a coordinating pattern or solid for the piping (which is only on the top side of the bumper). We use only grosgrain Offray ribbon and seal the ends to prevent fraying (this has been tested thoroughly and upholds the test of washing and wearing well). These bumpers have zippers on the bottom side of the bumper so you can remove the batting to wash. We recommend washing on cold and gentle cycle and laying flat to dry so they do not shrink. Please do not wash the batting as we cannot guarantee the outcome. You can select one of your pattern choices in the drop down menu. Please leave your other instructions in the "notes to seller" box on the checkout page. You may list your preference of ribbon color, or we will choose the best coordinating match with your bedding. You can select 1, 2, 3 or 4 rail covers. This will depend on the style of crib you have. The long rail cover is 8"x52", the short rail covers are 8"x27" (if you need your rail covers longer please message me to see if you need a custom listing). You can also select a scalloped long rail cover, with ruffled trim. You can specify which color ribbon you would like used for the ties or I can choose for you if you do not have a preference, we offer: white, ivory, light pink, peach, coral, navy, gold, gray, mint. Decorative Pillows: We make covers for any size decorative pillow form including shams and euro shams. Please message me for a custom listing if you do not see the size you need. This changing pad cover is exactly what I wanted for baby girl's nursery. 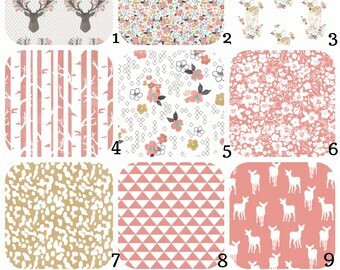 I also ordered the pillow cover, bedskirt and rail cover and they are beautiful!! Pattern is #17. Fits perfectly! Needed a new cover without spending a fortune -- and wanted something outside the dockatot line. Super cute! Affordable! Washable! Originally had an issue w/ shipping. Shop refunded full price for the inconvenience and the item ended up arriving as promised. Excellent customer service.